Sometimes, the best lessons are those that are unplanned. Time: Just after Recess. The kids come into class all excited and sweaty. I hear some buzz about D and a butterfly, but thinking it’s about a sticker or something trivial, I ignore it. But as the lesson continues, the buzz gets louder, and in between tasks, a small group of kids gathers around D. I peep, and to my horror, I see a butterfly (It’s a Monarch butterfly, a girl informs me) pinched in between a pair of fingers, held just above an empty bag of potato chips. It is alive. Let it go, I tell D. Put it outside. She complies, but the class troops along, just to see what will happen. At first, I ask them to just look and observe the butterfly, and then go back to class. No touching. Just look. But pushing and shouting ensue as they try to get a better view. It’s way too chaotic. I decide to get them back in, but no amount of shouting will pry them away. Both teachers from the classrooms on either side of us come out and give me icy looks. One closes her doors. I finally herd the class back in, but their minds are still on the butterfly. It is now I get the lowdown on what happened. A girl from another class had challenged two girls from my class, D and A, saying that they ‘would get 10 points if they caught a butterfly’. Points for what, nobody knows. But the challenge was issued. D and A go to the field, and miraculously, D manages to catch a butterfly (‘Just by clapping’, D says, gesturing). Having no other container, she puts it in her empty bag of potato chips. The girls, possibly remembering some bits of Science, then throw in some flowers and sticks (‘Sticks?’ I ask during the retelling. ‘Whatever for?’ They look at me blankly, considering this for the first time). So now. We have a butterfly outside on the ledge next to the corridor. I talk a bit about how butterflies are meant to be free so we can all admire their beauty. But what’s going to happen to it? Someone asks. Someone else notes that some of the powder on the wings has been rubbed off. And another someone else takes this time to inform the class that if you rub your eyes after you touch a butterfly’s wing, you will go blind. A few more girls have stories of insects and animals. I look at their 9-year-old faces. I see alarm and worry. “Okay. All we can do now is hope for the best,” I say. I decide that since my lesson has been derailed anyway, I would just seize these teachable moments. 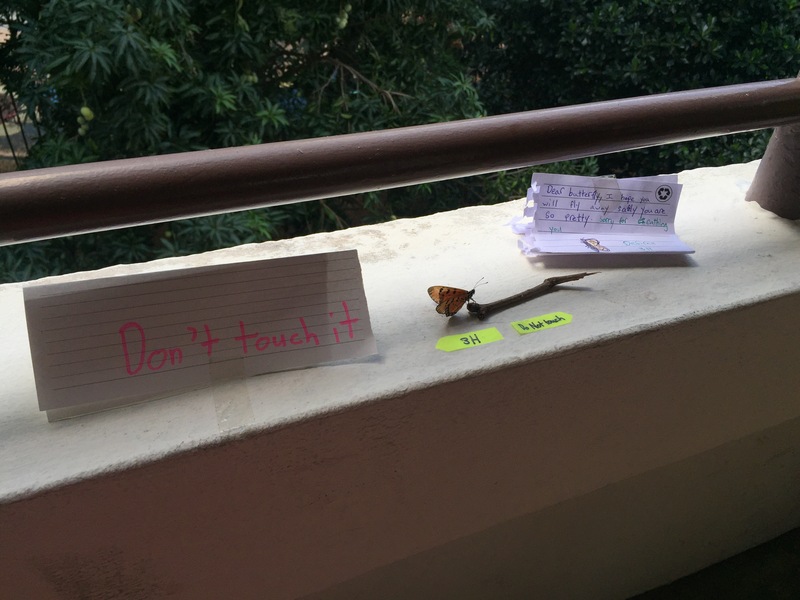 Within 2 seconds, 2 girls have written ‘don’t touch it’ signs and taped them near the butterfly. I write ‘Dear butterfly,’ in my free writing book on the visualizer. The class has gone quiet. Everyone is earnestly writing in their books, and on scraps of paper. They still want to check on the butterfly though, so I say they can go quietly and observe it in small groups. More noise. The teachers emerge again. One at a time, I say. The kids quarrel a bit about turn-taking. I’m writing in my own free writing book, and want to see how they settle this. Admirably, they come up with a queue system of their own. They observe the butterfly, and try to match its colours in their book with their colouring pencils. It fell! A girl announces. The whole class panics. I make sure the butterfly is alright, then step in to calm them down again. Call it authentic learning. Call it a teachable moment. Call it a reckless abandonment of Unit 2 corrections. But I’ve never seen the class as engaged in a writing task before. Midway through, D goes out and puts her note near the butterfly. She’s touching it! Someone cries. But it’s hers! Someone retorts. It isn’t hers! Another says. It belongs to…one girl says ‘the air’, another says ‘no, it’s God’s’. I listen on, still intently writing. It is a rather fascinating, this concept of who owns nature. The period ends. I walk out of the classroom, and I see D’s note. I run to the staffroom to get my phone and snap a photo. 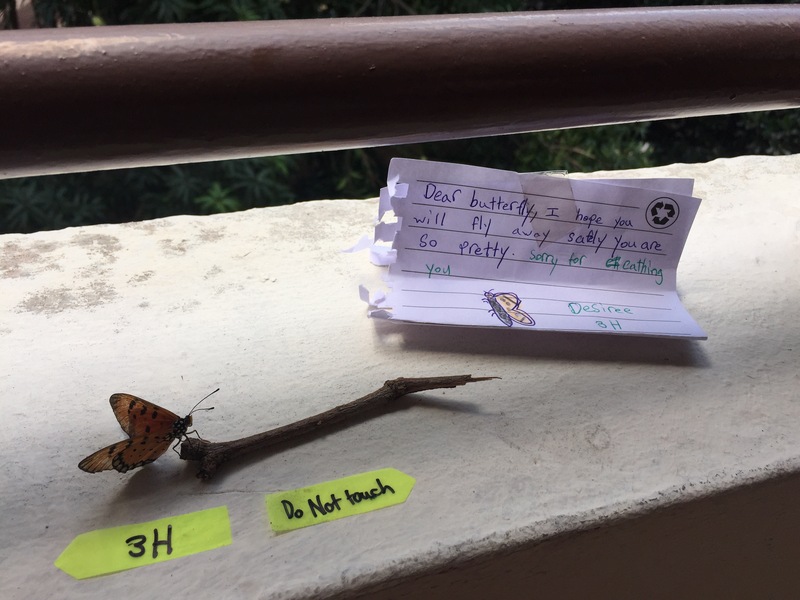 And later, when I return after school to clean the notes up (one girl I asked said the butterfly eventually flew away), I see a ‘get well soon’ note taped to the railing. We’re sharing about what we have written tomorrow. I’m looking forward to it.